Set in the late Edo Period. 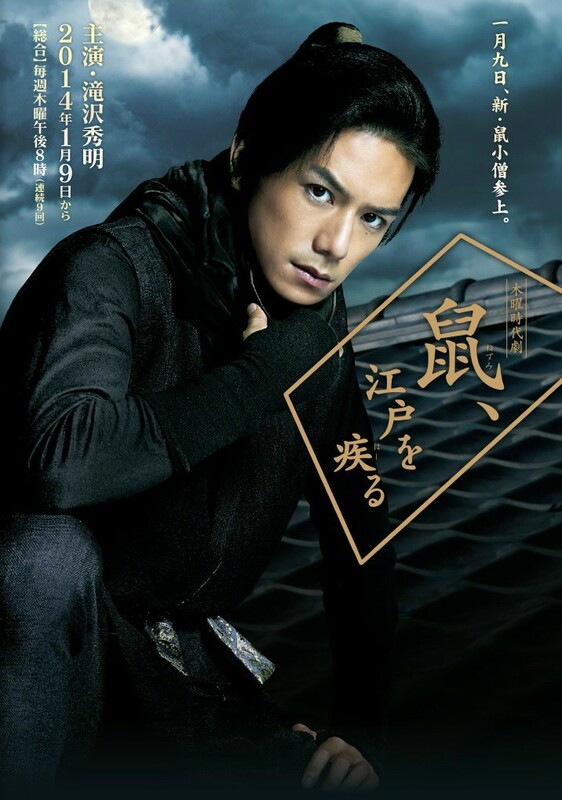 Jirokichi (Hideaki Takizawa) plays around during the day, but at night becomes a completely different person. His nickname is Nezumi-Kozo (literally “Rat Boy"). Jirokichi steals gold coins from corrupt samurai families and hands it over to the poor. He works with his younger sister Kosode (Shiori Kutsuna). Based on novel "Nezumi, Edo wo Hashiru" by Jiro Akagawa (published December 22, 2004 by Kadokawa Shoten ). Portabella May 13 2018 7:02 am I am catching up on j-dramas starring mainly Takizawa Hideaki, Kyoko Fukada, Mirei Kiritani etc ... Am a late starter in the Japanese entertainment scene and I am loving all the dramas that I've watched thus far! Hazel loves Kutsuna Shiori! Jan 15 2014 9:55 am wow! so this would be my beloved kutsuna shiori's first tv series for 2014! \(^0^)/ I'm excited to watch this and see her doing cool fighting moves using whether a wooden stick or sword, I'm so happy for her that she receives more tv project which is more of having the main role with manly or strong action scene, that's good for her! additionally I already watched a special behind the scene and an interview of the cast. I think it was a tv show in Japan who made that attack interview to promote also their tv series. By the way I am Hazel from the Philippines and an avid fan of Ms. Kutsuna Shiori I wish that we could meet and I could tell her how much I idolize her, I even have a drawing in a scrapbook I made for her and even fan-made music video of her. I started to like her in Detective Conan Live Action Series. If you want to watch my fan made video just search my site "Hazel loves Kutsuna Shiori" in there I also uploaded Matsumto Jun tv drama "SMILE." VISIT IT!